Become the best version of yourself – positive, motivated, and energized! Our fastest acting stress and anxiety relief formula, Gaba Max, features a unique blend of amino acids that work together to give you a calming effect that you actually feel in a matter of minutes! Your emotional state affects everything in your life, both physically and mentally. Your ability to stay motivated, focused, and even to learn and make better decisions depends on your feelings. 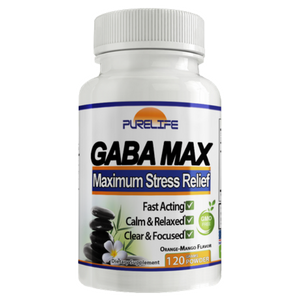 Gaba Max contains Phenyl-GABA, the most potent, and only form of GABA to pass through the blood-brain barrier. Combined with other scientifically proven ingredients like Theanine, TMG, and DMAE, Gaba Max makes a well-rounded formula for neurological harmony. By calming the overabundance of chemical signals in your brain that are present in states of stress and overwhelm, clearing away mental chatter and lifting your mood, you will feel more empowered and able to lead with your best foot forward. Being that GabaMax comes in powder form, it’s great for mixing in your favorite beverage (we recommend water, fruit smoothies, or even tea!). Taurine: An amino acid that activates GABA. It can also regenerate brain cells in the Hippocampus (where memories are formed). Glycine: An amino acid that binds to both GABA and Glycine receptors in the brain, providing a calming effect. It can aid in a better sleep, detoxification, and preventing cancer. DMAE: Improves attention and mood, especially for ADHD. Tri-Methyl-Glycine (TMG): Improves memory and attention; Aids in methylation, an important metabolic function. As a dietary supplement, adults mix 1/3 teaspoon (2000mg) in any beverage on a light or empty stomach. Full effects are typically felt after 60-90 minutes. Use a baker's teaspoon for more accurate dosing. Best used on a cyclic or periodic basis. If tolerance develops, cease use for a week. Use caution when increasing dose. Do not exceed 2/3 teaspoon (4000mg) per day. WARNING: Keep out of reach of children. Not intended for those under the 18 years of age. Gaba Max may increase sensitivity to alcohol. Do not drive or operate heavy machinery if consuming Gaba Max with alcohol. Consult with a physician if pregnant, nursing, or on anxiety medication. Amazing for any kind of negative emotion, or just as a quick pick me up. Definitely helps calm and reduce negative emotions. Feels good.